One New Aftermarket Replacement Complete Gasket Kit for John Deere 2-Cylinder Tractor Models: A (SN 584000>), AO (SN 272000>), AR (SN 272000>) - Overhaul Set without crankshaft Seals. (INCLUDES EVERYTHING PICTURED) Replaces Part Number: FS1699S, OGS321. Our processing system is automated. Thank you for your continued patronage. We carry parts for Engines, Transmissions, Front & Rear Axles, Hitch & Drawbars, Undercarriages, Final Drives, Seats, Bearings, Cups, Cones, Seals, Discs, Couplers, Gears, Brakes, Pressure Plates, Pilot & Throw Out Bearings, Ring & Pinions, Gaskets, Decals and MORE for most high wear items. We also carry replacement parts for the Boom Cylinder (Seal Kits, Tubes, Glands, Pistons, Rods). 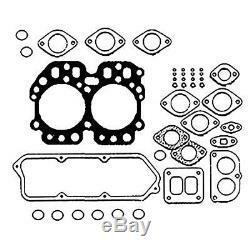 The item "FS1699S Complete Engine Gasket Kit 2 Cyl for John Deere Tractors A AO AR" is in sale since Thursday, May 22, 2014. This item is in the category "Business & Industrial\Heavy Equipment Parts & Accs\Antique & Vintage Equip Parts".